Kawasaki introduced the JET SKI name to the world over 40 years ago and now, after decades of technological development, Kawasaki used all of our experience and know-how to build the ultimate high-performance, large capacity watercraft: the all-conquering STX-15F 4-stroke JET SKI. The Kawasaki JET SKI STX-15F is one watercraft that does not compromise performance for value. With a powerful four-stroke engine, a sporty-handling composite hull and plenty of rider-friendly features, the STX-15F is great value for enthusiasts seeking fun on the water. Casual cruising with a couple of passengers, towing a water skier across your local dam or screaming along the coastline on your own, the STX-15F will blow your expectations into the sunset. The perfect Jet Ski for easy use and pure joy of riding a person water craft. The STX-15F boasts a host of handy features including storage compartments in the bow, glove box and under seat for carrying a fire extinguisher, tool kit, cooler and more. There are adjustable rear-view mirrors, finger throttle control, a magnetic ignition switch for extra security, plus an adaptor to connect the fresh water flushing fitting to your garden hose. 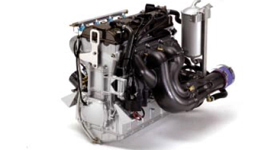 The 60mm single throttle body fuel injection system utilises an individual injector per cylinder to provide instant starting, superb throttle response, quick acceleration, smooth engine performance and a dramatic reduction in fuel consumption. The engine’s highly tuned exhaust system is water-jacketed to help reduce underhood temperatures and keep the STX-15F running as quietly as possible. 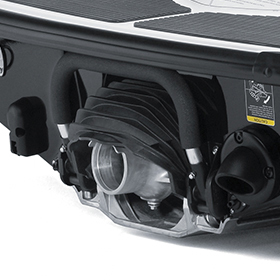 It features dual water mufflers to maintain very low exhaust noise levels. The STX-15F’s drive system consists of an axial-flow pump utilising a three-blade oval-edge stainless steel impeller to provide excellent hook-up and maximum drive at all operating speeds. 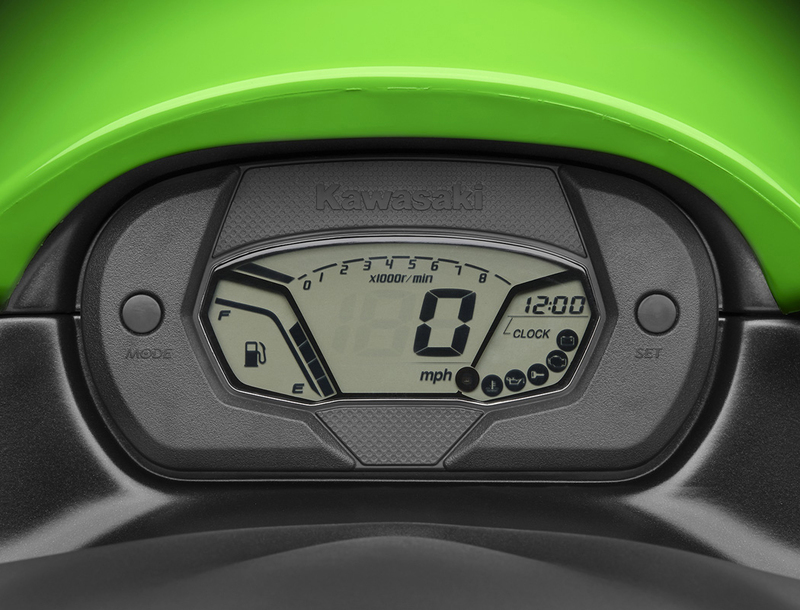 Designed to assist inexperienced riders, the Kawasaki Smart Steering system is electronically linked to an on-board microprocessor and automatically adjusts engine speed and thrust while cornering to ensure a smooth, controlled turn. The STX-15F’s high-performance, 1,498cc, 4 cylinder, DOHC, fuel injected, 4-stroke engine was adapted from technology developed through Kawasaki’s leading edge range of Ninja sports motorcycles. Multi-function digital instrumentation includes a digital speedometer, tachometer, fuel gauge, hour meter, trip meter, clock and warning lights for high temperature, low oil pressure, immobiliser, low battery voltage and EFI system. Thanks to clever engine design and precise tuning, the STX-15F boasts extremely low emission outputs, meeting the strictest existing emission standards issued by the Environmental Protection Agency (EPA) compatible with future Australian emission regulations. Greatly assisting low-speed manoeuvring is a reverse ‘bucket’ fitted to the steering nozzle. Shaped to deliver optimal thrust and directional control when reversing, the bucket is made from injection moulded plastic, which virtually eliminates corrosion. The STX-15F’s deep-V hull is made of fibreglass and gel-coated for a lustrous, scratch-resistant finish and features the moulded-in Kawasaki Splash Deflector (KSD) to help minimize spray on the operator. High-performance sponsons help get the hull up on plane and provide “grip” while the hull design facilitates precise cornering, increased stability at high speed and a smoother ride in rough water. The open rear deck has plenty of space well suited for getting into water skis or for use as a diving platform, and its close-to-the-water height and automatically retracting boarding step make boarding in deep water a breeze. 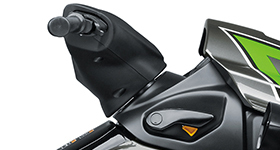 The STX-15F features Kawasaki’s electronic Smart Learning Operation (SLO)-Mode function allows new riders to become familiar with the handling and response of this JET SKI watercraft at a relaxed pace before operating the STX-15F at full power. 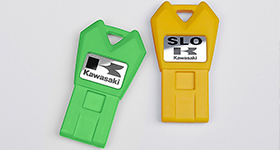 Two separate keys (Yellow for SLO-mode, Green key for full-power operation) prevent operating mistakes.